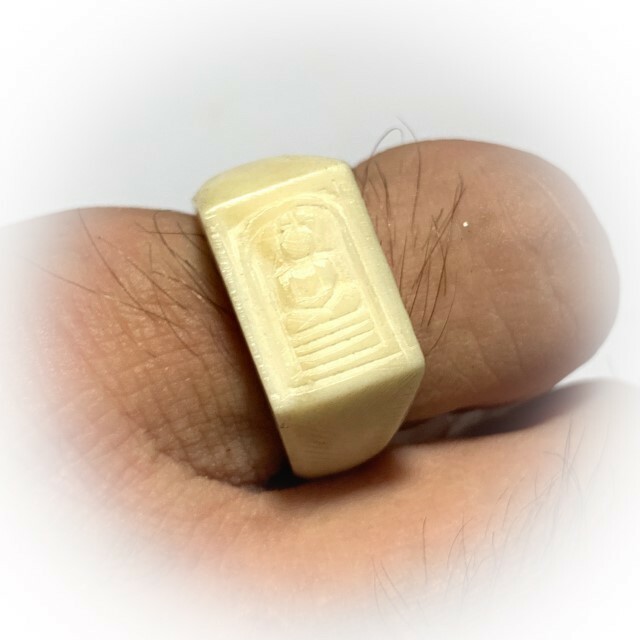 Sacred Hand carved ring with Pra Somdej Buddha Image carved into the surface of the ring head, from the Great Luang Por Gan of Wat Khao Gaew (2434 BE - 2513 BE). 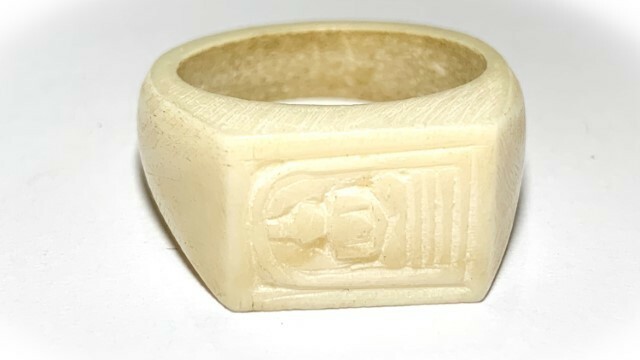 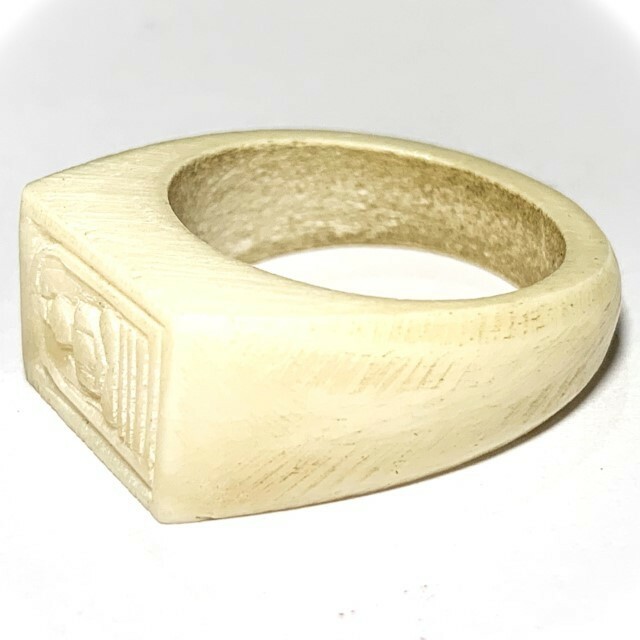 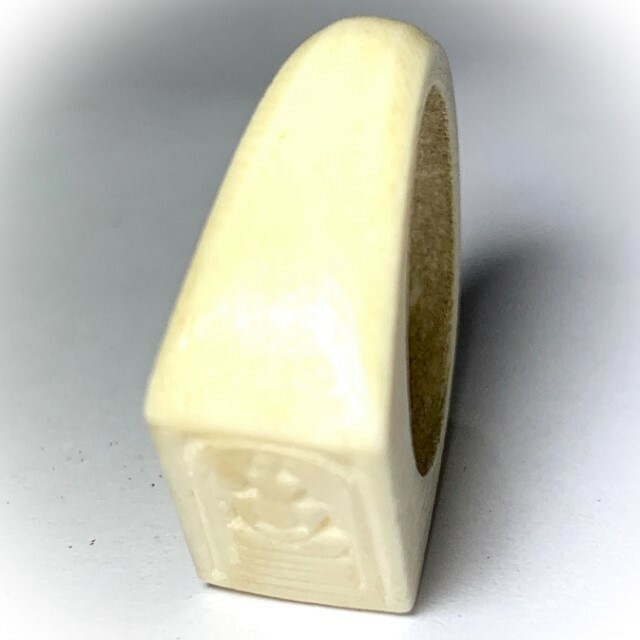 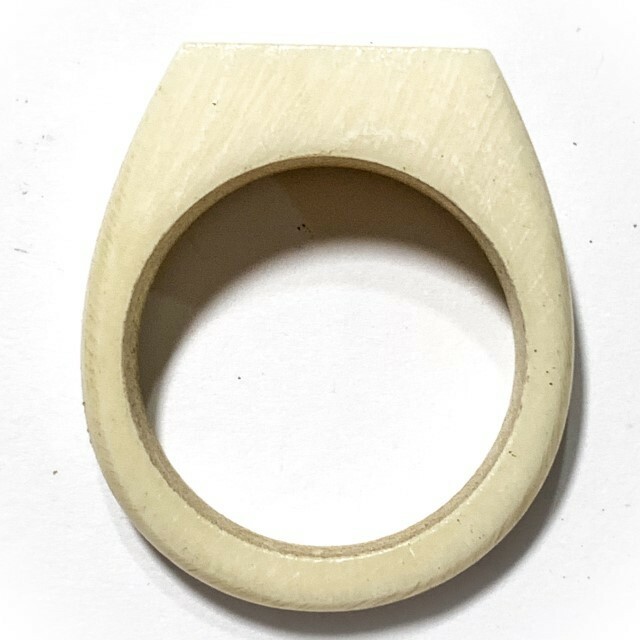 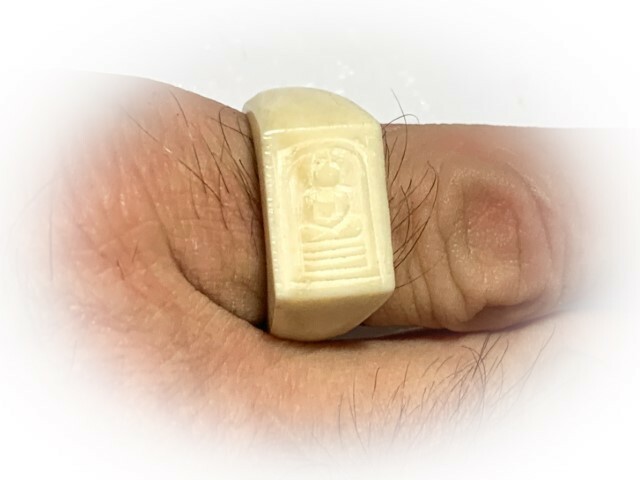 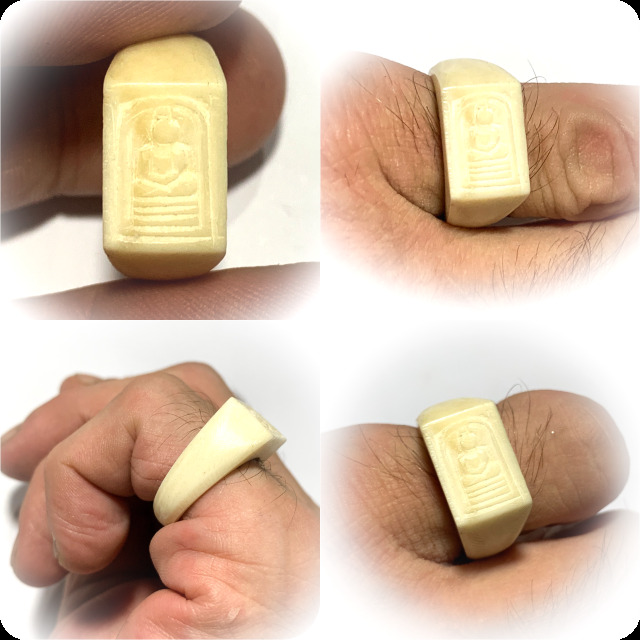 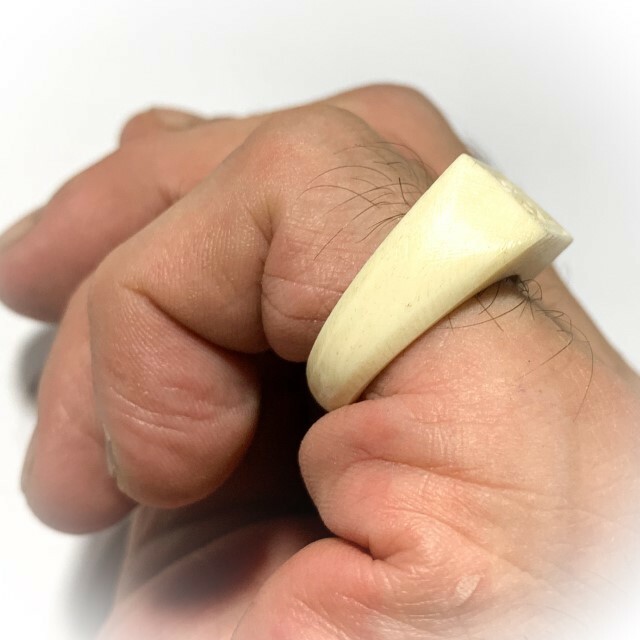 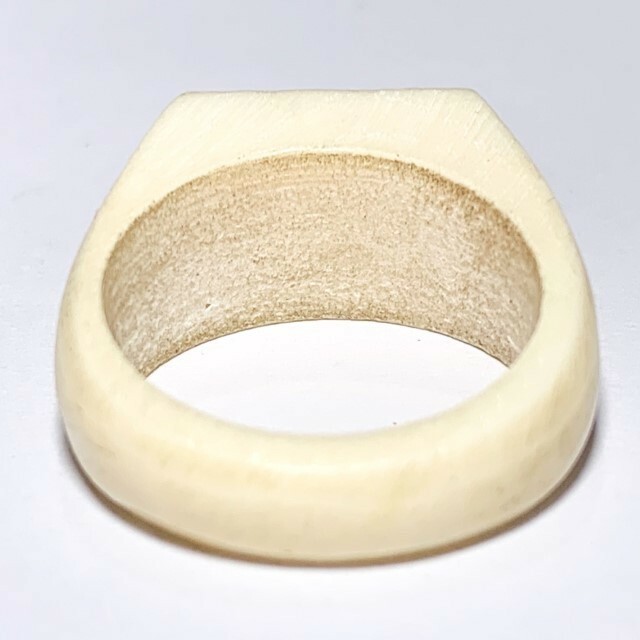 The ring measures 2.2 Cm inner diameter, and is carved from a piece of ivory, with the image of a Buddha seated upon 3 tiered dais within an arch (Pra Somdej). 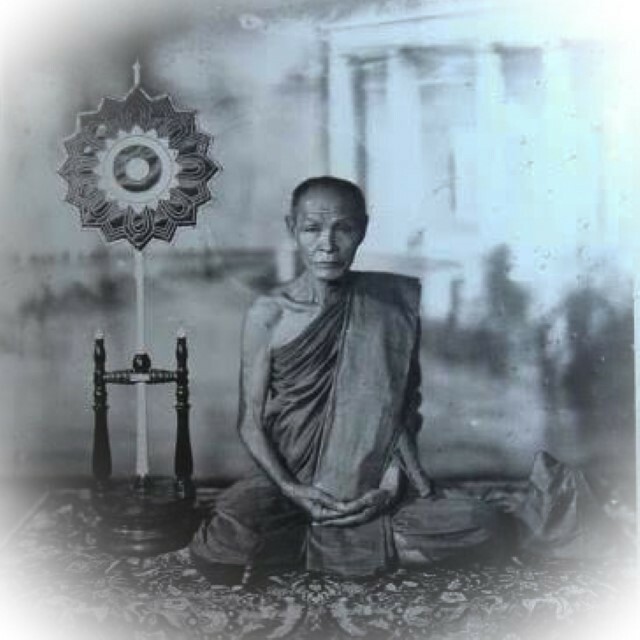 Luang Por Gan was a 'Sit Aek' Prime Apprentice of the great Luang Por Derm, and received direct Wicha transmission from LP Derm himself. 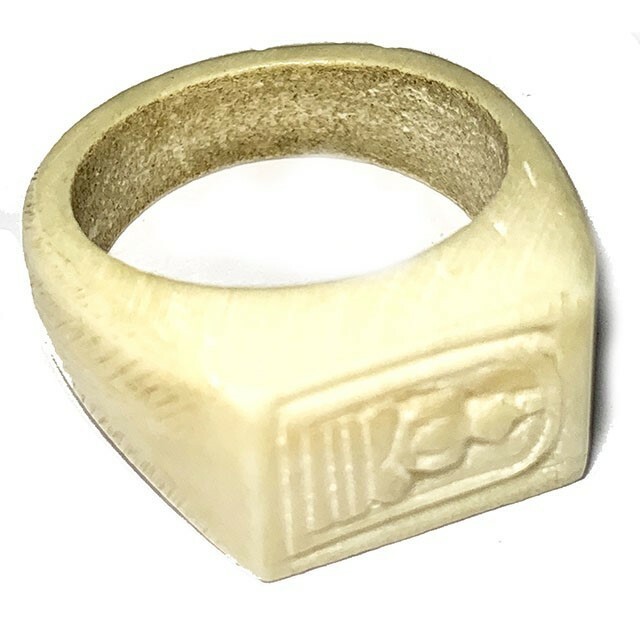 Famed for his magic rings and Rian monk coins. 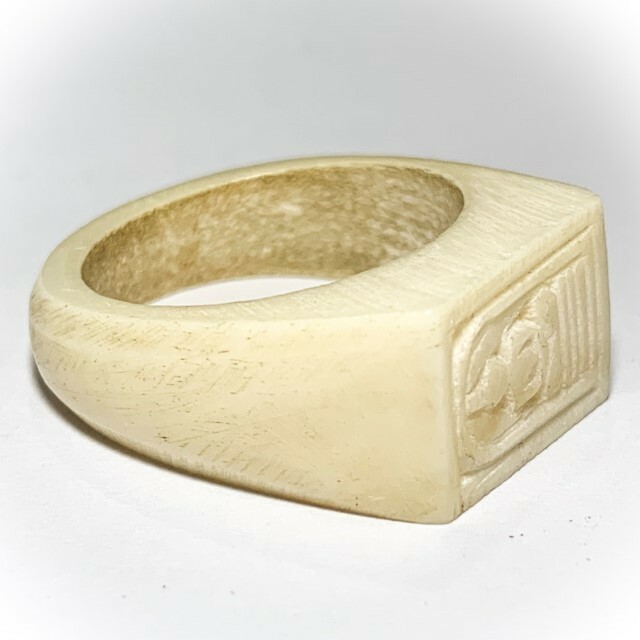 The ring is one of the rarer items of Luang Por Gan, along with his famous carved Tigers. 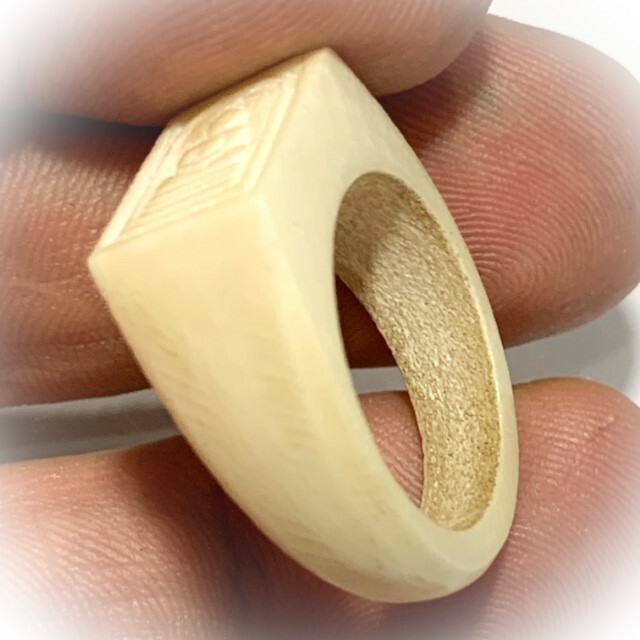 His ability and tendency to make and empower amulets made of carved wood and ivory comes of course from the Wicha bestowed upon him by his Kroo Ba Ajarn Luang Por Derm, who was of course the leading Master in carved ivory Singha Lions, Ivory Mitmor Knives, and other wood and ivory carved amulets. 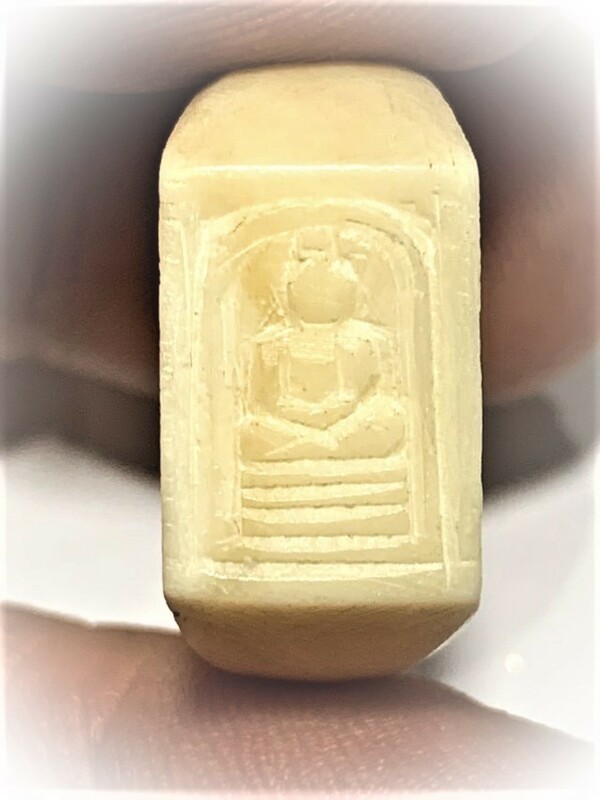 The Hwaen Pra Somdej is imbued with Serm Duang Karma Improving magic, with Metta Mahaniyom Mercy Charm, Klaew Klaad Evasion, and Serm Yos Promotion Power. 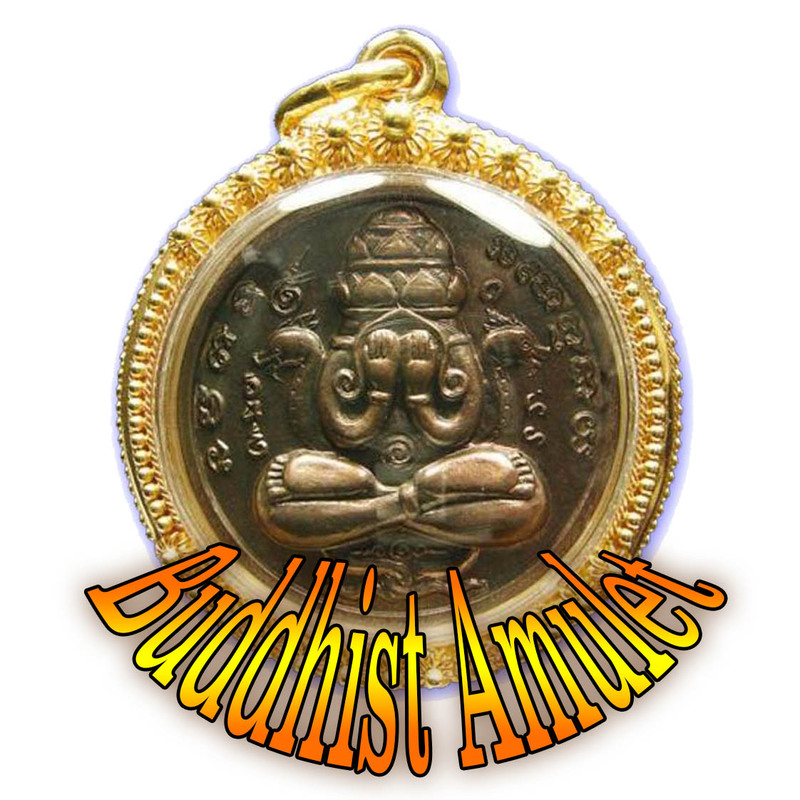 The amulet, being a Buddha image, is also Pure Buddhanussati to remind a Buddhist of his or her practice to sustain mindful attention on the objects of focus which the Buddha taught to practice, and to keep the moral precepts, which in turn brings auspicious blessings through Buddhakhun Power. 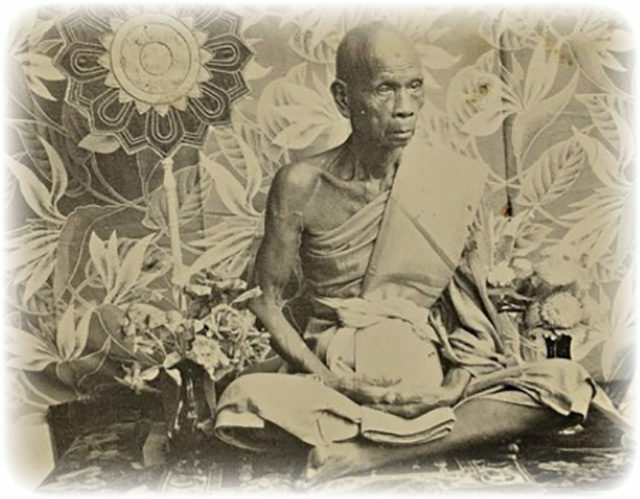 Luang Por Gan was ordained in the year 2454 at age 20, with Luang Por Kham of Wat Khao Gaew as his Upachaya ordaining officer, and remained there until superceding Luang Por Kham after his passing, after which Luang Por Gan became the abbot of Wat Khao Gaew, until his passing in the year 2513 BE. 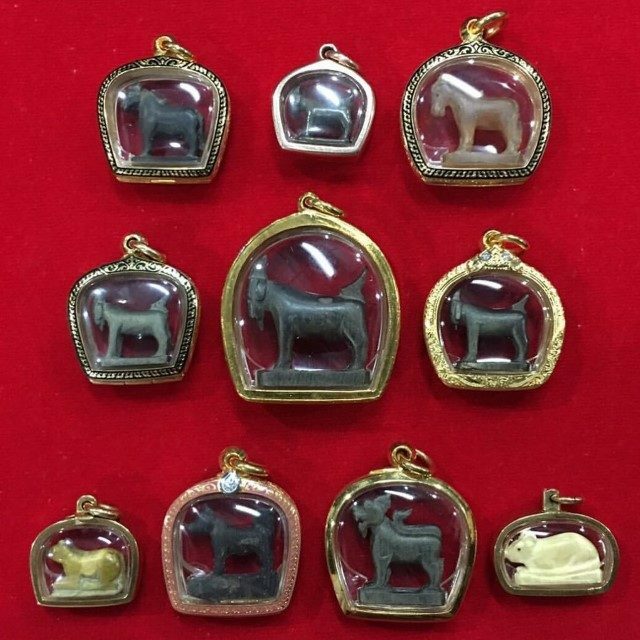 It is known for a fact that Luang Por Gan was an important and high apprentice of Luang Por Derm, because it is recorded in many documents of LP Derm visiting Buddhist Places of Pilgramage and Temples to help refurbish, restore and build, that LP Gan would almost always accompany LP Derm, along with Luang Por Choi, another Sit Aek first apprentice of LP Derm. 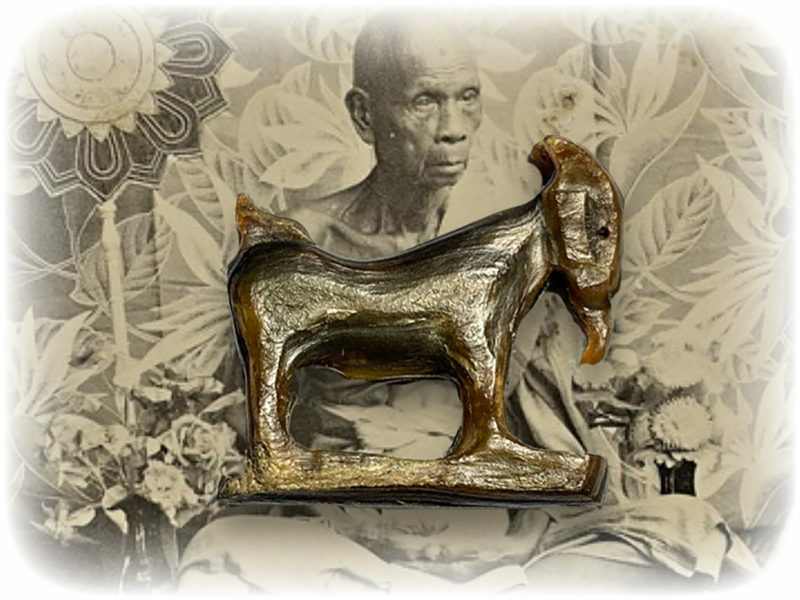 Both Luang Por Gan and Luang Por Choi were faithful apprentices and devoted assistants to Luang Por Derm. 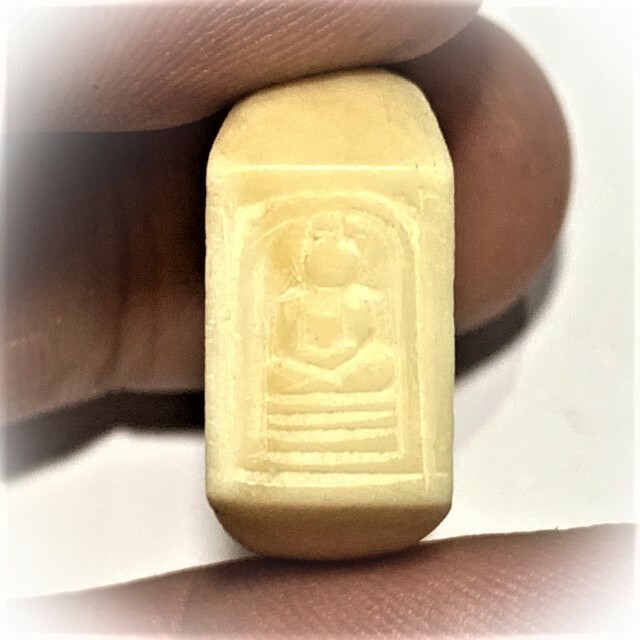 close your eyes and make your prayers and wishes.